SARASOTA, FL--(Marketwired - Jun 11, 2013) - A penthouse unit in downtown Sarasota's Vista Bay Point sold at a real estate auction on June 7 through J. P. King Auction Company. The 3,300 square foot residence includes a private, rooftop veranda with views of both the ocean and downtown Sarasota. Eleven bidders from Florida, North Carolina and New York sat with onlookers in the residence's living room, overlooking the water through its panoramic windows. Craig King, president and CEO of J. P. King Auction Company said Friday's auction is another reason to be optimistic in the high-end real estate market. "Last week's auction is a great indicator that a recovery is on its way in the luxury market. Nearly a dozen bidders showed that they are prepared and confident to begin investing in high-dollar properties through the absolute auction method." Larry Snipes of Fayetteville, N.C., was Friday's high bidder and purchased the unit through Sarasota Eagles Nest, LLC. Through the auction company's national marketing campaign leading up to the auction, J. P. King received 4,701 web hits and interest from 11 states regarding the Vista Bay Point event. In the two weeks of showing prior to the sale, 24 property tours were given, and six brokers represented bidders on auction day. The property's seller, Derwood Godwin, purchased the unit in 2004 sight unseen. After spending years searching for the perfect views in a beach property, he knew Vista Bay Point offered the views he was searching for from the plans alone. "The best thing about it is the views. There's not another view in Sarasota County anywhere close to this," Mr. Godwin said. "When we saw the plans for this, we knew this was finally it. We bought it from the picture, and it's even greater than I thought it would be." Along with its sweeping views of Longboat Key, Bird Key, Lido Key, the Sarasota Bay and downtown Sarasota, the three-bedroom, 3.5-bathroom residence encompasses the entire floor of the 17-unit building. Included in its amenities, Vista Bay Point caters to its high-end residents with an athletic center, heated pool and spa, theater room, guest suite, event facilities, game room, billiard table and a catering kitchen and bar. The home's private, rooftop veranda includes a domed kitchen and bathroom, along with seating for around 30 guests. About J. P. King: J. P. King Auction Company specializes in high-value properties such as luxury homes, condominiums, land and ranches. The company has marketed properties in all 50 states and six countries and has upcoming sales that include an investment opportunity in Alabama, the Kentucky Lake Motor Speedway in Kentucky, a home in Tennessee, a 30-acre peninsula on Lake Barkley, the Birch Creek Ranch and Palisades Bench in Swan Valley and Venture Farms in Washington. 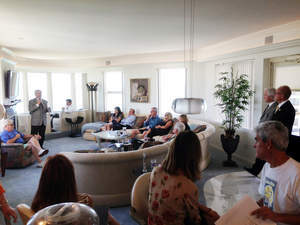 Eleven registered bidders gathered at the absolute auction of a penthouse unit at Vista Bay Point in Sarasota, Florida on June 7.